Graduate programs in library and information science programs provide strong theoretical foundations in information systems, library organization, library history, management, collection management to support user needs, reference, information literacy instruction, and specialized information resources. While practical course projects create approximations of professional librarianship, the best hands-on learning experiences include work-based learning through internship placements in actual libraries. Internships immerse students in valuable hands-on practical work in real-workd settings. Internships also learn from the interns' perspectives on library processes and challenges, while also providing library professionals with enriching opportunities to mentor library students and convey knowledge to future generations of professionals. Mays, Antje. 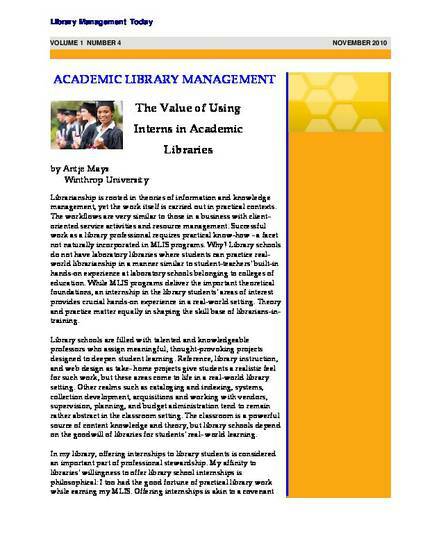 “The Value of Using Interns in the Academic Library”. Library Management Today, November 2010.